Elliot needed some pumpkin-love in his life this fall. And rumor has it pumpkin is good for dog bellies. It settles their stomaches. Pumpkins are so thoughtful like that. 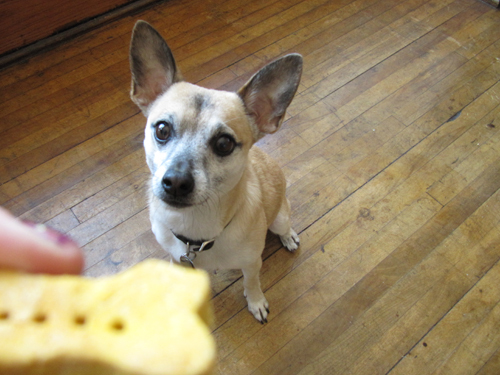 When I give one of these to Elliot he chomps away and then checks the floor really well to not waste a single crumb. So he really likes them, and I bet your pup would too! 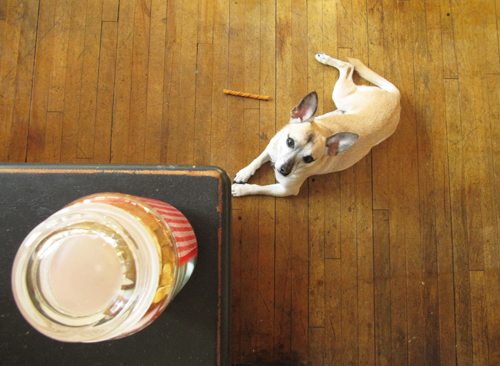 Now he spends a lot of time laying on the floor staring at the jar hoping to eat more and more. It really messes up his usual schedule of napping in the living room, and then in a sunny patch, and then in the bedroom. 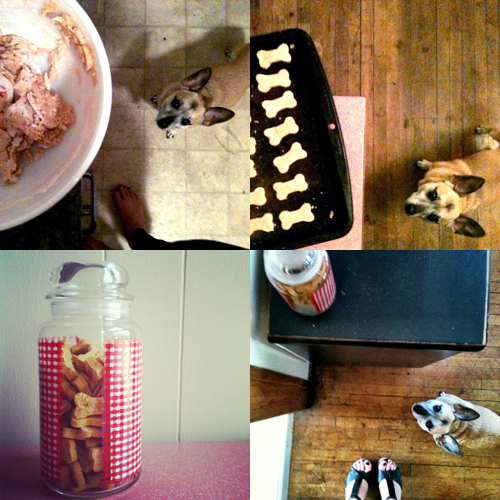 So if your pup is needing a fall pick-me-up, then this is just the thing! Preheat your oven to 350° F and get out two baking sheets or one large baking sheet. No need to spray with cooking spray. In a large bowl whisk together the pumpkin and eggs until combined. Add the dry milk, sea salt and stir it up. Slowly add the brown rice flour and stir until combined. Feel free to get in there with your hands and knead the flour in. Roll dough out on a lightly floured surface 1/4-1/2″, depending on how crunchy you want them to be. Cut out using a small cookie cutter and place on your baking sheets. 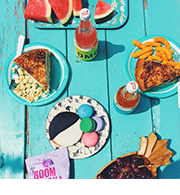 Press a fork into the center of each biscuit. Bake for 20 minutes, flip them all over and bake for 15 minutes more. Cool completely before giving to your pup. Want to make another kind also?! 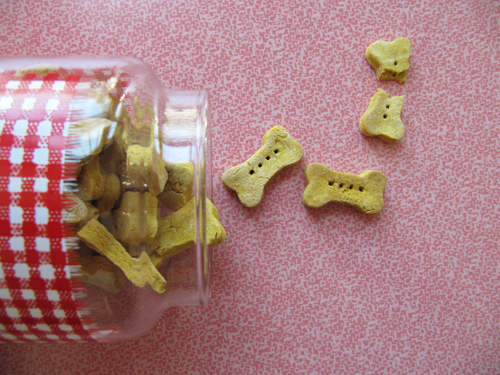 Try these Peanut Butter Dog Treats too! He just really loves them. And I just really love him. I SO want to make these…I am finishing up the peanut butter ones first and THEN I will get some powdered milk…sounds yummy for Lucy! oh, pumpkins…so pretty and tasty for people and pups alike! he must reallllyyy love them to let ’em interrupt that serious napping schedule. 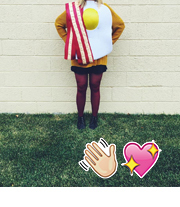 Pumpkin love is true love. I just love Elliot. He’s such a handsome guy. I might need to make these for Bailey and Abbey! Glad I stumbled upon your blog! I love it! Thanks Meghan! <3 I'm glad you stumbled across me too! 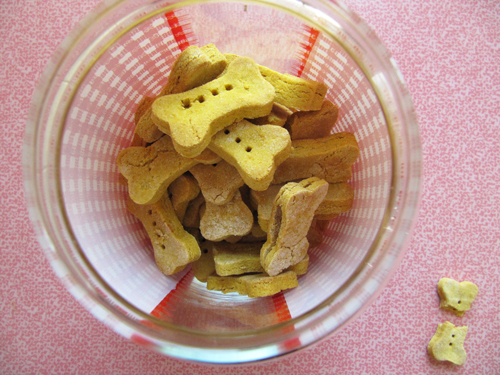 They look so sweet in the jar 🙂 these would make ne sweetest doggy presents! Just took these out of the oven!! I have one sitting over by me..waiting for it to COOL so I can give it to Lucy!! I didn’t have powdered milk so I used strawberry soy powder! My kids love that in water, and I figured it’s very milk like, so why not?